The centerpiece of the $100 million redevelopment of Buffalo's Northland Corridor remains on schedule for completion and opening in August. Friday morning, leaders gathered to celebrate a construction milestone and encourage local citizens to step forward and take advantage of what they call a transformative project for the city. The Northland Workforce Training Center, a $65 million facility reusing an idled plant on Northland Avenue, will host advanced manufacturing and other skilled training for candidates to enter the local workforce. Construction continued on the ground level of the 80,000-square-foot Northland Workforce Training Center in Buffalo. On Friday, government leaders announced the project is entering the final phase of construction and remains on schedule for an August completion. Work began in June of 2017. Friday morning, officials announced internal demolition, remediation and stabilization are complete. 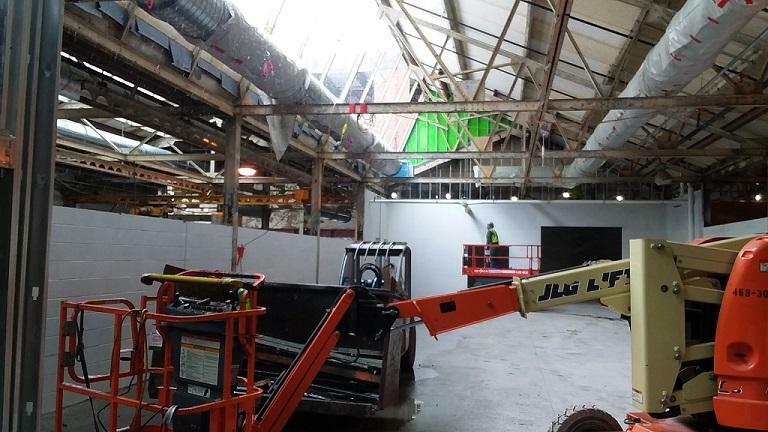 Concrete floors have been poured and officials pulled tarps in a ceremony to unveil the first of several new windows, replicating the original 1911 panels. "Seeing is believing," said Mayor Byron Brown, who declared the opening of the new 80,000-square-foot facility is four months away. "This is probably one of the most transformational projects to happen in this community in decades." Lieutenant Governor Kathy Hochul was present mark the milestone and tour the work in progress. She renewed the Cuomo Administration's commitment to rebuilding Buffalo as a hub for industry and commerce and said the East Side will be a part of it. "They are going to be part of this economic recovery. 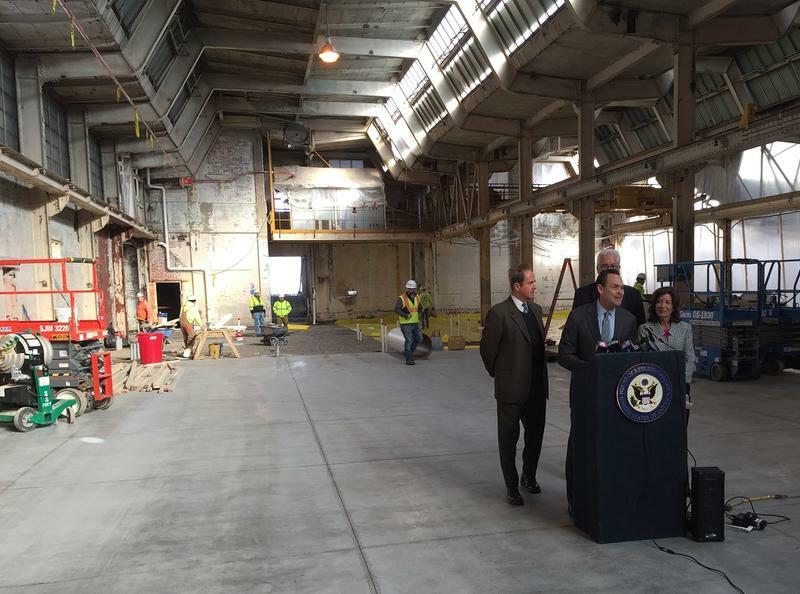 That is our commitment and today is a symbol of that commitment," said Hochul. When it opens in the fall, the Northland Workforce Training Center is expected to provide training for 150 to 200 candidates. Stephen Tucker, president and chief executive officer of the center, challenged the public to take advantage of the opportunities and come forward. Stephen Tucker. president and chief executive officer of the Northland Workforce Training Center, speaks Friday. 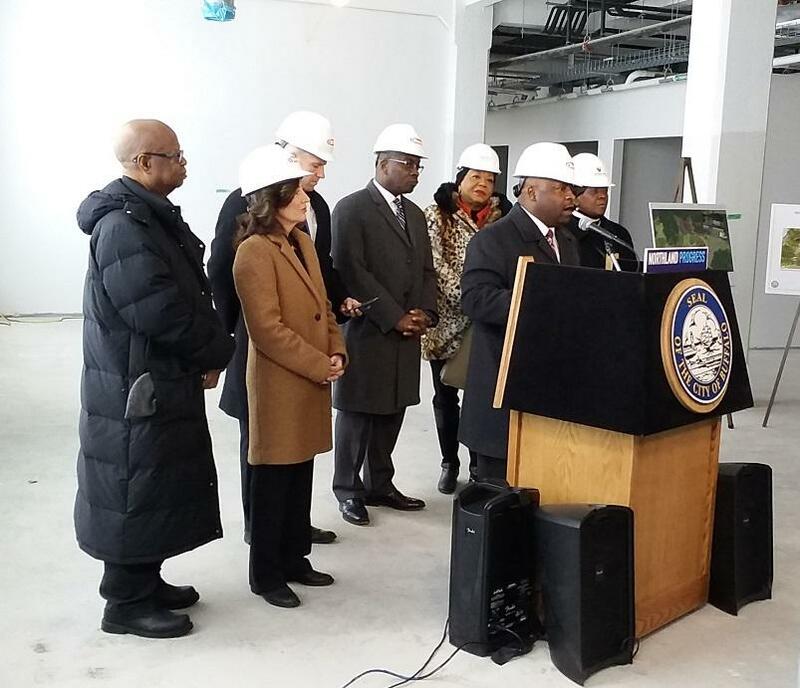 Among those gathered to provide an update on construction were Mayor Byron Brown, Lieutenant Governor Kathy Hochul, State Senator Tim kennedy and Assemblymember Crystal Peoples-Stokes. "We have an outstanding staff of professionals waiting, waiting on you to take the first step," he said. "We're going to provide college credit, college training, leading to degrees from SUNY universities. We are going to place you in a job. All we need is you." Tucker stated that he was advised by the Buffalo Niagara Manufacturing Alliance that they have approximately 3,100 openings. Assemblymember Crystal Peoples-Stokes spoke on behalf of residents in Buffalo's 14215 zip code, saying they're among the earliest to rise and work at least one job to make ends meet. She sees the center as a means to help them find the full-time job, and perks that come with it, that will allow them to truly prosper. "In terms of soft skills, don't question those because if they can get up in the morning and open somebody else's business and then leave there and go work in another business, they have the soft skills. What they need is the advanced skills to get the higher-paying jobs that will allow them to take care of their families by working one job as well as be able to get benefits," Peoples-Stokes said. Construction continues on the Northland Workforce Training Center in Buffalo's East Side, a project that many look upon as the anchor of broader Northland Corridor redevelopment. On Tuesday, elected officials, labor leaders and representatives of the financial community announced that millions of dollars in new markets tax credits are fueling the project, warning that federal tax reform has threatened the future use of such credits. The state has awarded another $4 million to the Buffalo Northland Corridor redevelopment project. Buffalo's Planning Board on Monday removed the last barrier to starting a major piece of the city's Northland Corridor, approving a series of demolitions and renovation of 683 Northland. Work on the $60 million Northland Corridor Redevelopment Project is ramping up. The focus of the mostly-state funded project is a workforce training center.